I was one of the very fortunate Friends of ALSC scholarship winners to “A Wild Ride: 75 Years of the Caldecott Medal” preconference at the Art Institute of Chicago. 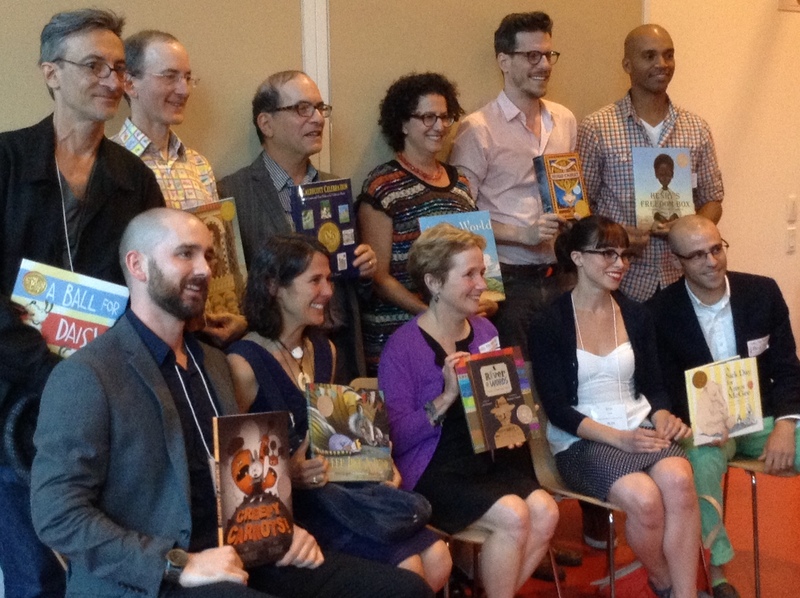 I feel very blessed to have attended this event, especially as I am going to be on the 2015 Caldecott Committee. I feel pretty blessed to be on that as well, but back to the preconference. Art. A whole day devoted to art, and not just any art, but picture-book art in particular! I think I can say with confidence that most children’s librarians would be pretty excited to be in the same room with 12 Caldecott artists and a whole room full of people who love children’s books. Love them to tears, in fact. Maurice Sendak said that he did not write books for children. Yet his books delighted generations of young people, and adults as well. If Brian Selznick is right (and I think he is), Mr. Sendak’s books will be known by generations to come. Selznick’s opening speech tickled the funny bone then very deftly took us on a wild ride through Caldecott history and ended us up in tears with his loving tribute to Maurice Sendak. Thank you Brian Selznick for your words, your thoughts, and your fabulous outfits. I was going to recap the day, but Martha Parravano did that quite eloquently her on the Horn Book blog, so for a very good recap, read her post! 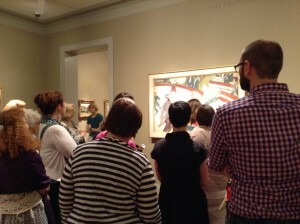 Instead, I will share a few things I learned about looking at art. Line. It is so much about line. Emotion and movement can be shown with just a tiny squiggle. A sad face, a ripple in water. The moment is captured by line. And line can be just that, a line, or it can be the shape of a whole body or an element in the painting. Shapes, curves, and broken lines are all there. Standing rapt in front of Toulouse-LaTrec’s painting “The Equestrian” and discussing line with an art historian was a personal highlight of the day. Relationships. What is the relationship of the picture to the text? Sendak said that only beautiful text can make beautiful pictures “perfect”. And when the text stops, we are forced to look at the pictures. We are forced to carry on with the story from the pictures. Look at how the wordless spread is used in so many Caldecott winning books! Paul O. Zelinksy reminded us that art is an act of translation. Art is a translation of the stories that we tell, the stories that we are. Influences. So many picture books are influenced by great art. After all, the illustrators are ARTISTS; most went to art school. So we need to look at art to understand picture books. But not just art, great books, poetry, film, other picture books are also influences. So much goes into the making of these books. Preparing the art. We got such a wonderful insight on the preparation and work that goes into the making of a picture book. We saw Chris Raschka’s process for A Ball for Daisy, and Jerry Pinkney talked about the color stock and weight of paper, as well as the rhythm of the printing press reflected in the turn of the page. We saw how Erin Stead transformed a clay sculpture into Amos McGee. And in another conference session, Calde-totts, I actually got to page through Beth Krommes’ hand-drawn dummies for The House in The Night. It was like touching wet paint on a Van Gogh. The whole day made me appreciate the picture book on so many levels. These tangible objects that entice children into the world of art and reading are lovingly created by a team of very dedicated people. And then librarians get hold of the books and fly on John Gilpin’s horse with them. I cannot thank the ALSC team enough for this remarkable opportunity. But I’ll try anyhow. Thank you, thank you, thank you, thank you to everyone who made the day at the Art Institute of Chicago a magically wild ride.